Wampler have collaborated with Tom Quayle to come up with what may well be one of the most innovative dual overdrive pedals to date. Tom Quayle is one of the UK's finest modern fusion guitarists, and for quite some time he had been simultaneously playing using the Wampler Euphoria and Wampler Paisley Drive pedals stacked together. This was a way in which Tom tried to break down sound barriers he was trying to surpass, but he still felt that his sound just wasn't quite what he wanted. This has consequently led to the development of the Tom Quayle Signature Dual Fusion Effects Pedal, allowing him to achieve that dual overdrive effect with just one pedal. This signature Dual Fusion pedal features two separate channels which accomplish the range of tones that Tom had been looking to create. Tom was very keen to ensure that Channel 1 would sound as close to a real amplifier as possible, so rather than sounding like a standard overdrive pedal he wanted complete transparency and this is exactly what the Dual Fusion offers. Channel 1 gives you a more vintage sound and features a switch so you can flick between either a Smooth or Fat setting depending on your desired tone. Channel 2 is the more aggressive of the two, providing a modern response that allows you to experiment across a wide range of musical genres, without losing that smooth character in each note. Channel 2 also features a switch offering either a Natural or Throaty tone; Throaty enhances the mid-range tones while Natural comprehensively enhances the overall tone. You can also stack one channel into the other to open up a whole universe of tones with incredible amounts of gain without any loss of transparency. Whether you are opting for the neck or bridge pickup, the pedal works tirelessly in both channels to ensure that every single note is perfectly tracked, no matter how quietly or loudly it is attacked. Whether you require a low gain, Bluesy tone, or an incredibly overdriven gain, you will not be disappointed with the pedal's response. There is more than enough gain to go around thanks to the dual overdrive channels. This pure analog pedal runs its signal paths seamlessly so you can enjoy any channel at your required settings for the best possible overdrive. 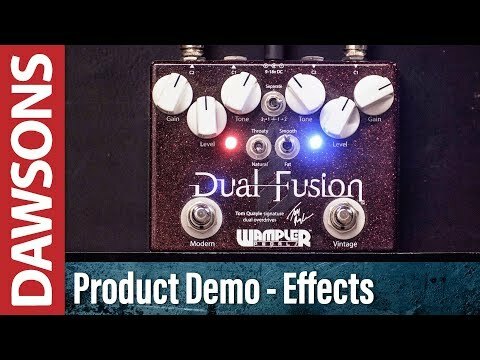 The Wampler Tom Quayle Signature Dual Fusion Effects Pedal is so versatile that once you own one you'll wonder how you coped without it beforehand!